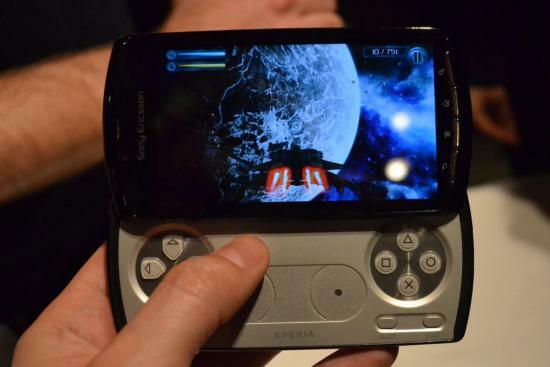 Here we are with an Xperia Play in our grubby hands at Mobile World Congress. The phone is a thick as you are seeing in these photos, but a little something to grab onto doesn't hurt when you're gaming, right? Glossy plastic on the back and plastic chrome on the edges makes this Sony Ericsson device a smudge-factory, but other than the odd-creak the phone feels fairly solid. Actually, on the units we played with here we find that the best-feeling buttons on every device are the main-gaming buttons, which is as it should be. We played a few of the launch titles - all Android games that have been rejiggered to include support for the Play. To a game they were all fast and performed well. We haven't gotten a good look at the custom Play interface and buying experience yet, but given that they're not launching the full Playstation store until later this year, it's not a huge surprise that those pieces aren't fully baked yet. Mostly we're just impressed to see all these Android games running so well here - and while it makes us think that a March purchase might be in our future, to be honest we may wait to see whether or not Sony can get their Playstation store out in short order. More photos after the break and we've got a quick video as well now too - feel the crowded, noisy love for Android gaming!